Our customers include distribution centers, manufacturing facilities, large-scale retail and home improvement outlets, industrial warehouses and assembly operations. 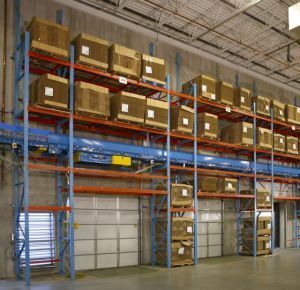 The Ridg-U-Rak team has the experience to handle large projects that require a variety of storage rack solutions or smaller jobs consisting of only 100% selective pallet rack.. The standard upright hights are 8, 10 ,12, 15, 16, 20 and 24' feet high. 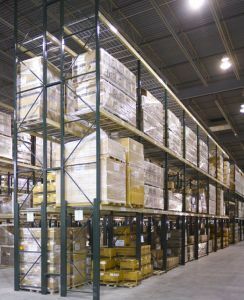 You can go taller with usage of mezzanines and of robotic storage systems. asrs. FAQWhat are the standard beam widths? 8,9,10 and 12 feet What are the standard upright hights? 8, 10 ,12, 15, 16, and 20 feet high What are the beam capacities? Beam capacities vary greatly from light weight capacities to extreamly heavy duty. Common requirments are 3,500 to 7,000 pounds. Are there seismic foot plates? Yes, 5 " x 8"
Is wire mesh decking available? Yes, in a wide variety of sizes to match beam widths and depths. What is the weight capacity of the uprights? Uprights range from 16,000 to 24,000 pounds. What colors are available? A variety of colors are avaiable depending on manufaturer. What style of upright holes are available? Tear Drop, What are typical depths for pallet? 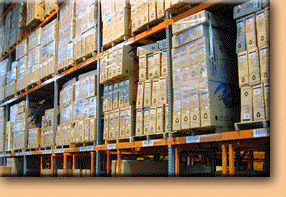 Rack depths of 36" 42" 48" are typical but others are avaiable, please call. Are frames bolted or welded? They can be either. In the US welded is more common while worldwide bolted are more common. 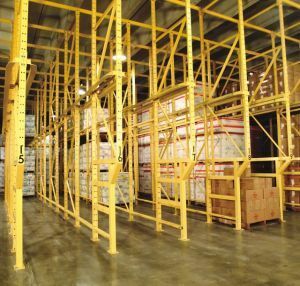 What acessories are available for pallet rack? 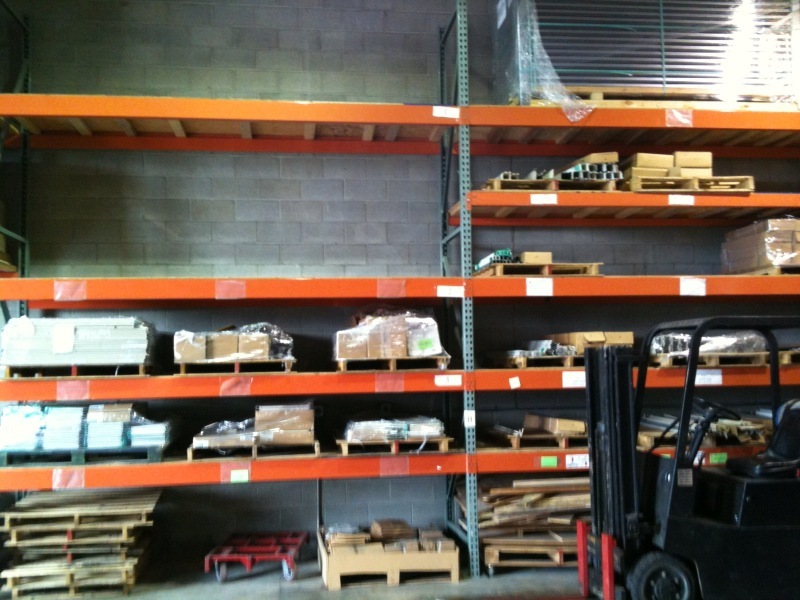 Post frame guards, row spacers, safety supports, lable holders, bay dividers, and many more. 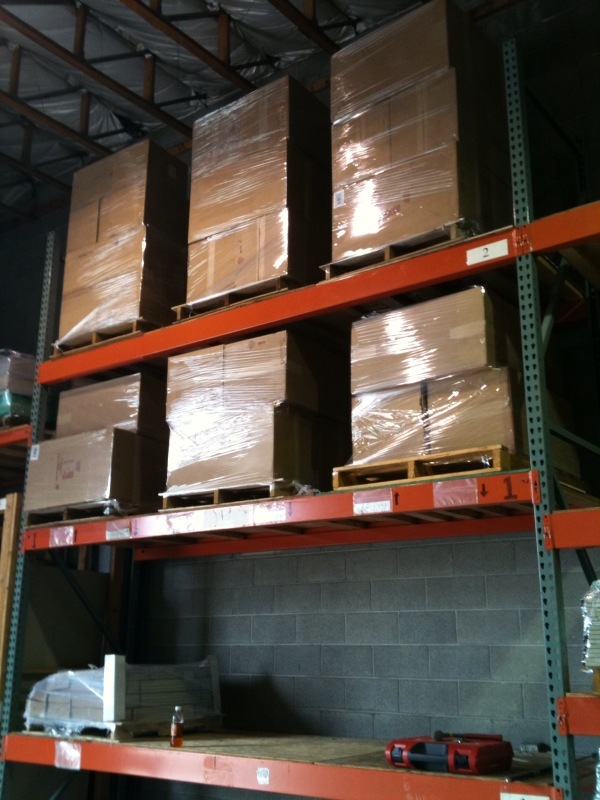 Penco, Interlake Pallet Rack, Frazier, Bulldog Rack, Durham, Nashville Wire, Jaken, Mecalux, Ohio Rack, Rid-u-Rack, Steelking, Tier-Rack, Artco (Tube) Pallet Rack,Buckley Pallet Rack, Burtman, Structural Pallet Rack, 'Altrui Pallet Rack, Dexion Pallet Rack, EMI Pallet Rack, Frick Gallagher Pallet Rack, Husky Crashguard Pallet Rack, Inca Pallet Rack, Lok-Rack Pallet Rack, Palmer Schile Pallet Rack, Sammons/Bloom Pallet Rack, Unarco II Pallet Rack, Keystone Style Pallet Rack, T-Bolt (Unarco) Pallet Rack, Speedrack Pallet Rack, Paltier Pallet Rack, Structural Pallet Rack, Sturdi-Bilt Pallet Rack, Ridg-U-Rack Pallet Rack, Webb/Slide-N-Lock, Hiline Pallet Rack, Penco Pallet Rack, Amerlok Pallet Rack, Artco Pallet Rack, Buckley Mastorak Pallet Rack, Dexion Pallet Rack, EMI Air-Row Pallet Rack, Engineered Products Pallet Rack, Frick Gallagher Pallet Rack, Hallowell Pallet Rack, Hi-Line Pallet Rack, Husky Pallet Rack, Inca Backbone, Konstant Pallet Rack, Lyon Pallet Rack, M-I-Rak Pallet Rack, Mecalux Pallet Rack, Nedcon Pallet Rack, Palmer-Shile Pallet Rack, Paltier Pallet Rack, Penco Pallet Rack, Prest / Jarvis-Webb Pallet Rack, Redi-Rack Pallet Rack, Republic Pallet Rack, Ridg-U-Rack Pallet Rack, Sammons Pallet Rack, Speedrack Pallet Rack, Structural Pallet Rack Frazier Structural Pallet Rack, Sturdi Built Pallet Rack, T-Bolt Pallet Rack, Unarco II Pallet Rack and other products make one full line! Need a brand you don't see listed? Please phone in to see if we carry it.